I often get comments about the pastel color tones I use in my photographs. While I don't use the Mextures App for everything, it is one of my favorite image processing tools for mobile photos. I've been using Mextures since... well, maybe the beginning of its existence! While some of the artistic filters/textures can be harsh or overdone, the more you work with the Mextures App the more you realize it can also be used as a subtle enhancing tool. One of the coolest things about the app is that you can save your filter presets as "formulas", which then generate a formula code that can be shared. This allows artists to exchange filter formulas for free! I've developed my own personal style within Mextures thanks to testing and playing with formulas to find what I like / don't like and over the years have created 69 formulas to date. I really like to enhance the colors of my nature photos *just enough* to give them a dreamy touch, without feeling overdone. If you love the magic hour like me, you'll love the following Mextures Import Formula I created. It's useful when you can't *quite* get Mother Nature's dawn / dusk colors to translate into a photo. To import the code, simply open Mextures, select 'Manage', click the red ' + ' sign at the bottom of the window, then enter the formula code. Importing and using the code is 100% free. Once the formula is imported you can easily tweak the levels to suit your tastes. While I was getting ready one day last summer (2017), I noticed a small grasshopper in the bathroom. My boyfriend pointed her out to me a little later in the hallway (yes, we both either let insects just do their thing, or put them back outside). 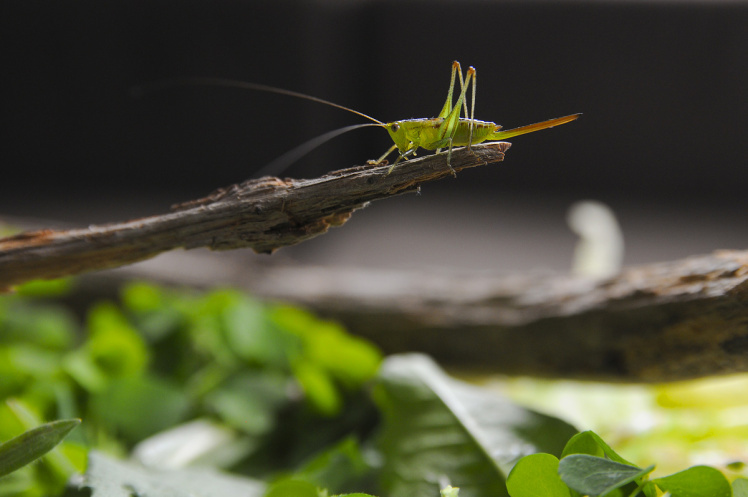 We did some research and realized she was actually a green cricket. While I thought she was absolutely adorable, I didn't expect her to jump onto my arm and live with us for five days... but that's what happened. So I made her a giant bed of wild greens, set it up in the living room with a few branches for her to climb around on, and watched her behavior for an embarrassing number of hours. I made videos and some photographs of her to add to my stock portfolio. I didn't know it yet, but the day she showed up ended up being one of the most devastatingly awful days I'd had all year. Later that night, life's events at the time got the best of me and I ended up crying myself to sleep. The next morning, I woke around 6 a.m. to find little miss cricket had gone up one of the branches and seemed to be pretty cozy there. I certainly didn't expect to have a morning cup of coffee with an insect, but that's what happened. And not only that, she made me laugh; she trailed along the branch back down to the plate of greens for some breakfast. It was just too cute for words. She needed a name. Cloud. When my boyfriend woke up that day, he was unexpectedly called into work. This would have normally been kind of a bummer to wake up to, yet he too was mesmerized by Cloud's adorableness and sat with us for awhile before he left. And that's how it went for the next few days while I processed through some dark emotions, Cloud kept me company. 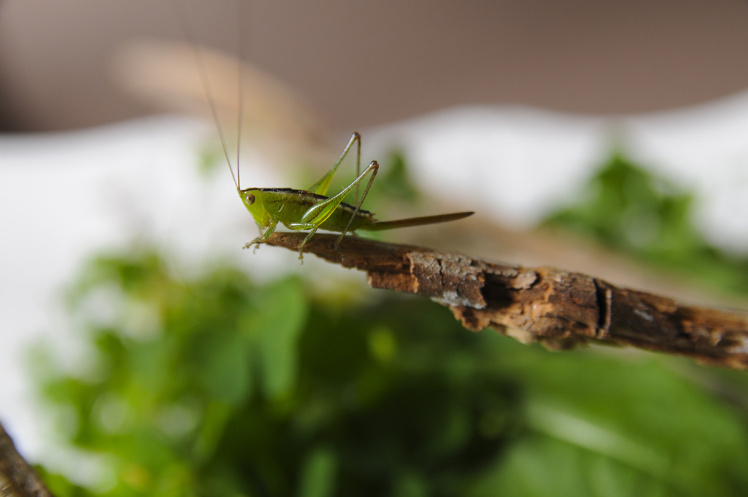 I can't begin to describe the close connection I felt to this little green cricket. She arrived with perfect sweetness during a time I might have otherwise allowed thoughts to become all-consuming. And had we not crossed paths, Cloud might not have survived. I was certain the Universe had brought us together. When she started getting braver and climbing around on the walls, I figured it was time to put her back outside. As silly as it sounds, that was pretty hard to do. Several weeks earlier I'd been reading from a book called "Teachings From the American Earth: Indian Religion and Philosophy'" which talks about placing yourself "lesser than an ant," in every interaction... when observing all things... to bring oneself into the experience of pure presence. You become the thing you are observing, in a sense. You become one with all. When Cloud showed up, that is exactly what I was able to practice with her, just what I needed at just the right time. When we create space for these kinds of interactions with other beings by becoming lesser than an ant, all beings become our sacred teachers. p.s. - here's a video of her. When you are surrounded by an expanse of sparkling Earth with your first cup of coffee. Thank you! You can look forward to 1-2 inspirational emails per month.